Via The Federalist (read the whole thing). They say it’s the highest since July 2007. It’s very sad to think of the plight of Venezuelan citizens, forced to scrounge for food, medicine and basic necessities. On the other hand, ten years ago they were pretty happy to spend the short-term gains acquired by stealing businesses and facilities from their owners. Kind of like Bernie Sanders supporters in our country, who are, I guess thankfully, still limiting themselves to tax mechanisms in their theft. Japan is reportedly planning to build a 130-petaflops supercomputer costing $173 million (£131 million) that is due for completion next year. According to the Top 500 site listing the world’s fastest computers, the current number-crunching champ is China’s 93-petaflops Sunway TaihuLight, followed by its Tianhe-2, coming in at 34 petaflops. Japan’s most powerful system at the moment is a 13.5 petaflops machine. Overall, Japan has the fourth-largest number of supercomputers in the Top 500 listing, after the US, China, and Germany. The UK comes in sixth; the most powerful system in the country is housed at the Met Office, and has a max performance of 6.8 petaflops. That’s 0.13 exaflops, or 13% of the way to the exaflop goal. Of course it would need to be affordable and commonplace for it to really impact society, and there’s still plenty of work to do in other areas (algorithms, storage, throughput, brain science, etc.). Posted by Retired Geezer in Entertainment, Man Laws. Mrs. Geezer and I ventured out into the Black Friday festivities today. Yep, the Target parking lot was empty, just like this commercial says. Welcome to Thanksgiving 2016!! I hope your chowing and shopping are rampant and excessive, and that your gatherings of friends and family are apolitical and congenial. Posted by Retired Geezer in Crime, Fashion. Another title could be: I’m thankful I don’t live here! You gotta click the link to see the worst traffic jam, evah. Trump supporters don’t think of themselves as Nazis. It’s liberals who think of Trump supporters as Nazis. If it was a Nazi, we should note that the number of Nazis in the United States is, thankfully, tiny (just read an article this past week where they were estimated it at 3000 – 30,000, but I can’t find it). I suspect the number in New York City is pretty much zero. If it was a real-live Trump-supporting Nazi unicorn, I doubt they would have screwed up the swastikas like the perpetrator did. I would think Nazis would have had a lot of practice at that. We’ve seen incident after incident (there’s one on Ace’s sidebar today) where liberals have faked racist or sexist or white supremacist hate crimes. 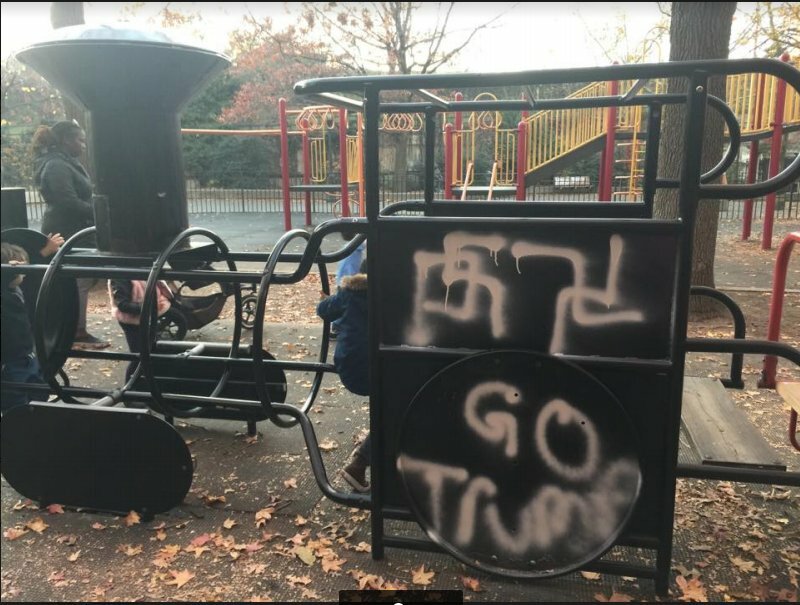 The style of those hate crimes is generally based on their fanciful notions of the twisted evils of Trump voters – hence the prevalence of Nazi and KKK references in these fabricated incidents. It’s ironic that their fears of a world where hate crimes are prevalent have driven them to increase the prevalence of hate crimes. Sounds like a perfect way to start Thanksgiving.